Berlioz first visited England in 1847, timing his arrival in London (no doubt unwittingly, but may be said appropriately) to spend his first full day there on the explosive date of 5 November. On 7 February of the year following England received its first performance of Harold in Italy, conducted by the composer himself, together with excerpts from the Damnation of Faust and the Requiem. The English critics wrote favourably with the exception, as Berlioz remarked in a letter to Liszt, of ‘a silly old fellow on the Morning Herald’. He had been accompanied by the English writer Charles Lewis Gruneisen, ‘who,’ as he says in a letter to his father [CG no. 1134], ‘as soon as we reached Folkestone, eagerly jumped ashore first so as to shake me by the hand and bid me a cordial welcome to British soil. One of those brilliant English ideas prompted by national pride, which would never occur to a continental.’ The same Gruneisen, writing anonymously in the Illustrated London News (12 February, 1848), was one of the first to give an account of the composer’s first concert in England, accompanying it with a short biography for the benefit of English readers. From the outset the English public, with very few exceptions, took to Berlioz. He made personal contact with J. W. Davison, the music critic, who gave him encouraging notices in The Times and the Musical World. The praise of Edward Holmes, being unexpected, was even more welcome. Berlioz had been told that Holmes had come to hear him with ‘the most hostile ideas’. Holmes reviewed the first concert in Atlas (12 February 1848) and followed this up with a warm tribute to a genius in advance of his age (Fraser’s Magazine, October 1848). And when Berlioz came to the Great Exhibition, Holmes wrote on the composer’s reactions to the children’s singing in the concert at St. Paul’s (Musical Times, 1 October 1851). Another critic who early recognized Berlioz’s genius was Morris Barnett (Morning Post, 12 February 1848). Henry Chorley’s retrospective Thirty Years’ Musical Recollections (2 vol. 1862) appeared nine years after the ill-fated Benvenuto Cellini, and while rather more critical than the anonymous reviewer in the Illustrated London News (2.7.1853), who defended Berlioz as a ‘daring innovator’, Chorley records that he was struck by the opera’s many beauties and impressed by the willpower behind its conception. Such was Berlioz’s reputation in England during his lifetime. In the immediately succeeding years Berlioz and his music were comparatively neglected, being overshadowed by the vogue for Wagner. The article on Berlioz in the ninth edition of the Encyclopaedia Britannica (1875-84) was written by Francis Hueffer, and despite the author’s partiality for the German composer, it contained reasonably fair comment. Later he devoted a chapter of his Half a Century of Music in England (1889) to ‘Berlioz in England’. Another Wagnerian, Edward Dannreuther, contributed the article on Berlioz to the first volume of Grove’s Dictionary of Music and Musicians (1879). Not wholly understanding Berlioz’s aims, he emphasized unduly his ‘bizarreness’, a description of an aspect of his work loudly and often repeated by later critics. Dannreuther surveyed Berlioz in vol. VI of The Oxford History of Music: The Romantic Period (1905). Love of Wagner’s music blinded many critics to the different techniques and style of Berlioz; not Bernard Shaw, however, who recognized in Berlioz virtues largely hidden from his contemporaries. Though he wrote no sustained criticism on him, it is clear from references in London Music in 1888-89 and Music in London 1890-4 (Constable, 1932 and 1937) that he admired the intellectual as well as the unconventional quality of Berlioz’s music. Other critics, while less extreme, and more sympathetic in intent, still regarded Berlioz with some perplexity. ‘W.E.H.’ in ‘Hector Berlioz: a biography’ (Cornhill Magazine, July-December 1881) found his subject’s career ‘very strange’. Filson Young in Mastersingers (Reeves, 1901) dwelt at length on Berlioz’s ‘affairs of the heart’, thus creating a one-sided picture of him. Occasionally this lack of understanding was honestly admitted by the critic as his own failure, or as the result of a general ignorance of the music. W. S. Rockstro, in A General History of Music (Sampson Low, 1886), gives no indication that Berlioz wrote any opera other than Benvenuto Cellini, but confesses that the man and his music are largely unknown to him. Vernon Blackburn, having heard Les Troyens à Carthage at Cologne, was amazed by this unfamiliar work, and complained of the ‘lack of information which seems to prevail everywhere’ (‘Berlioz at Cologne’, Dome, November 1898). However, although Berlioz’s music was not widely played, first performances in England of most of the major works did take place in the last quarter of the century, some given by Hallé in Manchester, others sponsored by Ganz, Manns and Richter in London. That general ignorance prevailed, and that irrelevant aspects of Berlioz circulated, was probably due to the fact that no English writer had yet devoted a full-scale study to the composer. Joseph Bennett’s biography Hector Berlioz (Novello, 1883), while restrained and competent, was modest in scope and hardly to be regarded as a profound or definitive work. Frederick Niecks contributed a number of articles in the 1880s: ‘Hector Berlioz and his critics’ (Musical Times, 1 June 1880), showed him to be at least assembling the evidence. However, in ‘Berlioz’s “Messe des Morts” and its performance in Glasgow’ (Musical Times, 1 March, 1884), although finding much to admire, he seems not to have been personally attracted to the music. In other articles he approaches Berlioz safely from the literary angle: e.g. discussing ‘The “Lettres Intimes” of Berlioz’ (Monthly Musical Record, 1 July 1882). J. S. Shedlock, in a series of reviews (on Benvenuto Cellini, Monthly Musical Record, 1 February 1882; the Requiem, Academy, 2 June 1883, and the Te Deum, Musical Times, 1 December 1884), made analyses of the works as well as comments on the performances. For the Centenary Year of 1903 he produced, rather disappointingly, a generalized sketch of the composer (Monthly Musical Record, 1 December 1903). Some critics were beginning to recognize that Berlioz was no longer to be regarded as a grotesque figure, but as a musician to be respected. Sir William Henry Hadow, in his Studies in Modern Music (Seeley, vol. 1, 1893), devoted a long section to Berlioz and the French Romantic movement. He later took over the article on Berlioz in the second edition of Grove’s Dictionary (1904). More sympathetic towards the composer than Dannreuther, he nevertheless reiterated the complaint that Berlioz was technically unsound, and this stood for many years in a standard reference book. W. E. Henley wrote appreciatively for many years in Views and Reviews (Nutt, vol. 1, 1890), finally Berlioz’s genius was admitted in R. F. Sharp’s Makers of Music (Reeves, 1898). Although at several periods of his life he was invited to visit the United States, he never in fact went there. The reasons were mainly practical. ‘…We were at one moment on the point of departing for North America, but uncertainty for the future of Louis as well as the fact that he is so young, stopped us,’ he wrote to his sister Adèle on 2 August 1835. ‘Yesterday I received an offer from America’ (to Liszt, 2 July 1852). ‘It involved giving a series of concerts in New York. I did not accept; but if ever I do accept, won over by more advantageous offers, it will be simply in the hope of being able, on return, to give up my duties as a music critic which are my ignominy and despair.’ Since his music, when heard, has been generally appreciated in America1, it is very likely that a tour would have been successful—considering also that Berlioz has always seemed to spark off more from the Anglo-Saxon temperament than from the Latin. Without the benefit of personal contact, however, his acceptance in musical circles in America was slower than in England. During his lifetime Berlioz received notices in the American press from the composer William Henry Fry. One of the first to write about him retrospectively was William F. Apthorp. ‘An episode in the life of an artist’ (Atlantic Monthly, 1878) reviewed the Symphonie Fantastique and Lélio. A year later Apthorp brought out Hector Berlioz: selections from his Letters, and …Writings … Preceded by a Biographical Sketch … (New York, Holt, 1879). From this period we may cite also Nathan Haskell Dole’s A Score of Famous Composers (New York, Crowell, 1891), in which he devotes approximately forty pages to an account of Berlioz’s life, popular and general in appeal, but well-informed and restrained. As in Great Britain, however, lack of opportunity for hearing the music on any wide scale (although the works were played under Theodore Thomas and Leopold Damrosch) accounted mainly for his comparative neglect until well into the twentieth century. Berlioz’s Centenary was celebrated in England and America with less ceremony than in France, and with as little performance of the music. Nevertheless, the great triumvirate, Richter, Weingartner and Richard Strauss, gave commemorative concerts in London. English criticism was still mainly conventional, with old fallacies repeated ad nauseam: however, the Centenary Year did allow a few critics to emerge who showed signs of a more original approach. Of the old guard, Arthur Hervey’s French Music in the XIXth Century (Grant Richards, 1903) included a chapter on Berlioz and the Romantic movement generally favourable in intent, while repeating the charge of exaggeration, and emphasizing the brilliant orchestration, with the implied criticism that the musical content was weak. J. C. Hadden, who in the previous year had produced a short article on Berlioz’s love-life, contributed ‘Hector Berlioz’ to Macmillan’s Magazine (August 1903). Later, he was to unleash a series of platitudes in Master Musicians (Foulis, 1909), and repeat himself in Composers in Love and Marriage (Long, 1913). More aggressively anti-Berlioz, although without apparent reason, was John F. Runciman, who vented his spleen in a series of articles in the Saturday Review, ‘Berlioz’, ‘Berlioz again’ and ‘After Berlioz’ (21, 28 November, 12 December, 1903). However, some more factual, if not constructive criticism was beginning to emerge. F. G. Edwards, concentrating on Berlioz and England, wrote a series ‘Berlioz in England: a centenary retrospect’ (Musical Times, 1 July-1 November 1903), quoting from letters and reviews. ‘Berlioziana: a birthday in London’ (Musical Times, 1 December, 1903) gave data on first English performances of Berlioz’s works. Later Edwards was to write on ‘Berlioz’s Te Deum’ (Musical Times, 1 October 1906), again concentrating on historical fact. Also preferring fact to speculation, Charles Maclean described ‘The country of Berlioz’ (Musical Times, 1 September 1903) and ‘Berlioz and England’ (Sammelbände der Internationalen Musikgesellschaft, January-March 1904), sensible and restrained in comment. With these two critics providing some of the groundwork, others, such as Ernest Newman and Tom S. Wotton, gave promise of more mature criticism to come. While not hostile in intent, Frederick Niecks, author of the important book on Chopin, was far from recognizing the essential nature of Berlioz’s musical expression, as is clear from his Programme Music in the Last Four Centuries (Novello, 1906). In ‘The influence of Berlioz as an orchestrator’ (Monthly Musical Record, 1 May 1911), he cited Berlioz, with Meyerbeer and Wagner, as creators of modern orchestration, assessing Berlioz’s influence to be mainly on second-rank composers. From the literary aspect, in ‘Hector Berlioz as musical critic’ (Monthly Musical Record, 1 December 1915) Niecks criticized Berlioz for being too subjective, a more debatable viewpoint. C. F. Kenyon, under the pseudonym of Gerald Cumberland, continued to wield the heavy bludgeon, attacking Berlioz for being a ‘boaster’ (‘The psychology of Berlioz’, Musical Times, 1 February 1911). Richard A. Streatfeild included a brief account of the life and a discussion mainly in terms of programme music in Modern Music and Musicians (Methuen, 1906). His remarks were original, and he did not rely on well-worn attitudes, but it is evident that he failed to see Berlioz as a whole. Perhaps his preoccupation with the fashionable theme of programme music blinded him, just as a predilection for Wagner blinded others. Wagner supporters were still active: Gerald Abraham saw little in Berlioz, as he made clear in ‘The influence of Berlioz on Richard Wagner’ (Music and Letters, no. 3, 1924). As may be seen from textbooks of musical criticism, however, Berlioz was slowly gaining in reputation. H. C. Colles’ The Growth of Music (O.U.P., pt. 3, 1916), written for children, fairly sums up Berlioz in relation to the orchestra. A. W. Locke wrote an excellent and succinct essay on Berlioz as the arch-Romantic in Music and the Romantic Movement in France (Kegan Paul, 1920). Adam Carse’s The History of Orchestration (Kegan Paul, 1925) went into detail on the way in which Berlioz used his instruments and his sound effects. (Later, in The Orchestra from Beethoven to Berlioz (Heffer, 1948) Carse was to deal not only with the instrumentation, but also with Berlioz as conductor.) Some Famous Symphonies, by J. F. Porte (Reeves, 1927), while elementary as criticism, avoided some of the more dangerous fallacies. It is with Cecil Gray perhaps that we begin to feel the wind blowing more strongly for Berlioz, in his Survey of Contemporary Music (O.U.P., 1924) and ‘Notes on Music’ (Calendar of Modern Letters, September 1925-February 1926). At one time he thought of writing a book on Berlioz, but W. J. Turner forestalled him. In ‘A note on Berlioz’ (Nation and Athenaeum, 28 May 1927), he prophesied that the time for revaluation had come. By the late 1920s, therefore, it was clear that something should be done about the ‘Berlioz problem’. At the end of 1928 eight eminent composers and music critics took part in a discussion in a famous Soho restaurant, with the object of ‘airing’ their diverse views in order to see if any consensus of opinion could be reached. The discussion was published as Berlioz: being the Report of a Discussion … (O.U.P., 43 pages, 1929). Extracts were printed in the Dominant in England and in Gamut in America. The formidable and bulky Edwin Evans was in the Chair. He deliberately refrained from direct comment, but made it clear that he considered himself a mid-way admirer. The out-and-out champion of Berlioz was Sir Hamilton Harty, whose performances of many of his works had made a considerable contribution to English musical life, and whose article ‘The approach to Berlioz’ (Music Teacher, September 1926) had given the conductor’s view. Bernard Van Dieren, while not always going all the way with Harty, was also strongly pro-Berlioz. Percy Scholes, Percy Buck, M. D. Calvocoressi, Hubert Foss and Harvey Grace voiced reservations, roughly in that order of vehemence, the last being the most hostile. By way of starting the discussion, Foss quoted from an article by Richard Aldrich denigrating Berlioz. Harty then delivered his defence of the composer, laying stress on the view that Berlioz’s genius was literary in conception rather than purely musical, and calling attention to his sincerity of purpose. Buck argued that Berlioz was deficient in technique. Van Dieren refuted this view, and argued against Harty’s conception of a purely literary interpretation: Berlioz achieved the wholly satisfactory and direct translation into music of his emotions. Grace found fault with the harmony, but, as Scholes later pointed out, he was regarding Berlioz from the viewpoint of an organist. Scholes himself believed good interpretation of the music in performance to be essential. Calvocoressi had a number of reservations, and thought the ‘texture’ of the music weak. The Chairman sided eventually with Scholes, and ended by considering Berlioz as very much a man of his time. (Evans was later to contribute the biography on Berlioz to A. L. Bacharach’s Lives of the Great Composers, Gollancz, 1935, incorporated in The Music Masters, Cassell, vol. 2, 1950.) Scholes was to be the author of a textbook, The Listener’s History of Music. pt. 2: The Romantic and Nationalist Schools (O.U.P., 1930), in which he repeated the charge of exaggeration; while Calvocoressi, in articles written later, reconsidered the harmony, and concluded that Berlioz was if nothing else a considerable figure. English criticism of the inter-war years culminates in three major figures, two of whom had been writing on Berlioz for some time, but emerged as fully-fledged authorities in the 1920s and 1930s. These were Ernest Newman, W. J. Turner and Tom S. Wotton. Newman’s writings span some sixty years, from ‘The prose of Berlioz’ (Chord, September 1899) to ‘“The Trojans”: a final word’ (Sunday Times 29 June 1958). His one book devoted to Berlioz, the translation of the Mémoires (New York, Tudor, 1932) contained many valuable notes and comments. As early as 1901 (Contemporary Review, February 1905), he was agitating for a revival of interest in Berlioz, although his view of the composer was at that time the somewhat conventional one that he lacked melody and full achievement of purpose. In Musical Studies (Lane, 1905), Newman approached Berlioz from an original viewpoint as romantic and classic. The most refreshing thing about Newman was that his views developed. His opinions on Les Troyens, for instance, can be compared and contrasted over four decades: in ‘Berlioz and “The Trojans”’ (Sunday Times, 19 June, 4 September, 1921), in ‘“The Trojans”’ (Sunday Times, 24 March 1935), in Opera Nights (Putnam, 1943), as well as in the series of articles in the Sunday Times in April, May and June 1957. W. J. Turner began contributing articles in the 1920s, mainly to the New Statesman, generally appraising the composer and commenting on his works. This interest culminated in Berlioz, the Man and his Work (Dent, 1934). This was a non-technical biography, written with such enthusiasm and feeling that no one who cared for Berlioz and his music could fail to distinguish its true perception and understanding. Some have decried it for its partisanship; but more have valued it for its insight. Tom S. Wotton was perhaps the most significant figure of the three. He had been writing on Berlioz since before the Centenary of 1903. At intervals he contributed to magazines on such topics as the Berlioz version of the Marseillaise, the Reverie et Caprice, Les Troyens and the 1928 Discussion. In 1929 he wrote a number of articles, notably one on ‘Berlioz as melodist’ (Musical Times, September 1929); and a small book, Berlioz: Four Works (O.U.P., 1929), in which he analyses the Symphonie Fantastique, the Benvenuto Cellini overture, the song La Captive and the Corsaire Overture. This established him as a Berlioz authority with a sound musical background. Other articles in the next few years were followed by a short, concise biography of Berlioz in The Heritage of Music (O.U.P., vol. 2, 1934), edited by Hubert Foss, and Hector Berlioz (O.U.P., 1935), his greatest work, and the most important in Berliozian scholarship to that date. This independently observed study of various aspects of the composer and his music called halt to some of the more complacently accepted fallacies, and, in the pre-Barzun era, could be described as the first big assessment of Berlioz in English. J. H. Elliot’s Berlioz (Dent, 1938), in the Master Musicians series, was published after but written before the main work of Wotton and Turner. Being popularly priced and long available (the fourth edition appeared in 1967) it has perpetuated for the general public a grudging rather than a constructive approach. In earlier criticism, e.g. in ‘Manchester and Berlioz’ (Sackbut 1927/8), Elliot had shown that he did not personally respond enthusiastically to the music. In other articles, notably ‘The Berlioz enigma’ (Musical Times, July 1929); ‘Berlioz: genius or musical adventurer?’ (The Chesterian, January/February 1936); and ‘Berlioz and his critics’ (Music and Letters, April 1936), Elliot virtually admitted that he did not understand the composer… Later his views modified somewhat. 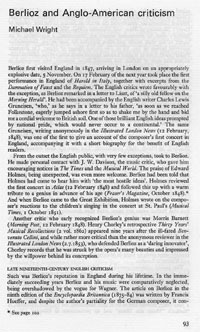 ‘Berlioz in our time’ (Hallé, January 1948) argues for a balanced appraisal; and in the latest edition of the biography he has tried to maintain an even view, but succeeded only in at best remaining aloof. He also contributed analyses of the Symphonie Fantastique and Harold en Italie to Ralph Hill’s The Symphony (Penguin, 1949), and a section to Arthur Jacob’s Choral Music (Penguin, 1963). Wilfrid Mellers reviewed Elliot’s Berlioz in ‘A prophetic romantic’ (Scrutiny, June 1938), producing, almost as a by-product, criticism of real insight. It is unfortunate that he has not written more. In Man and his Music (Barrie and Rockliff, 1962), written in collaboration with Alec Harman, Mellers treats Berlioz in relation to French music, and likens his technique in orchestration to that of writing chamber music. Constant Lambert was another acute critic of Berlioz’s harmony and melody in ‘The isolation of Berlioz: academic criticism’ (Daily Telegraph, 27 April 1929). Edward Lockspeiser wrote a short straightforward pamphlet-biography Berlioz (Novello, 1939), and also a number of occasional articles. Sir Donald Tovey included analyses of Harold en Italie, the Roi Lear overture, and the Scène d’amour from Roméo et Juliette in his Essays in Musical Analysis. vol. 4, Illustrative Music (O.U.P., 1936). The number of names began to grow. Ferruccio Bonavia wrote on the composer in the Monthly Musical Record, and Richard Capell covered concerts in the Daily Telegraph. Beecham gave performances in the tradition of Harty. Humphrey Searle, Martin Cooper, Desmond Shawe-Taylor, Neville Cardus, all wrote during this period, and are still writing in the 1960s. World War II put a temporary halt to progress, but interest was soon to be revived, and for the immediate post-war audience Eric Blom’s Some Great Composers (O.U.P., 1944) provided a brief biography. The violist Bernard Shore’s Sixteen Symphonies (Longmans, 1949) concentrated on the Symphonie Fantastique. 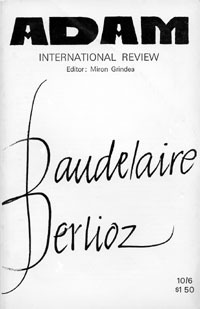 In Berlioz in London (Quality Press, 1950), A. W. Ganz, son of the conductor William Ganz, gave a vivid and detailed description of Berlioz’s visits to England and reproduced a number of relevant ‘lettres inédites’ and illustrations. Finally, the ardent collector Cecil Hopkinson brought out his valuable A Bibliography of the Musical and Literary Works of Hector Berlioz, 1803-1869 (Edinburgh Bibliographical Society, 1951). As in Britain American criticism produced little of note in the earlier part of the century. The composer Daniel G. Mason wrote on ‘Hector Berlioz and realism in music’ (Outlook, 10 November 1906), returning to the subject in ‘Berlioz and the beginnings of realism’ (New Music Review, December 1914, later reprinted in Great Modern Composers, New York, Gray, 1916). Olin Downes’ books of music criticism, The Lure of Music (New York, Harper, 1918) and Symphonic Masterpieces (New York, Dial Press, 1936), contain intelligent comment on Berlioz and his works; more is to be found in Olin Downes on Music …1906-1955 (New York, Simon and Schuster, 1957). While Paul Rosenfeld contributed some personal and invigorating opinions in Musical Portraits (Kegan Paul, 1922), Richard Aldrich’s article ‘Berlioz today’, published in Musical Discourse from the New York Times (O.U. P., 1928), was vehemently destructive. (This was the article with which Hubert Foss opened the Berlioz Discussion of December 1928.) The all-important article on Berlioz in the International Cyclopedia of Music and Musicians (New York, Dodd, 1939), edited by Oscar Thompson, was given a clear treatment by Gilbert Chase, although he followed tradition in finding a sharp contrast between Berlioz at his best and his worst, and regarded him as incomplete in achievement. Wallace Brockway and Herbert Weinstock’s Men of Music (New York, Simon and Schuster, 1939) shows a rather journalistic approach, and their The Opera (New York, Simon and Schuster, 1941) considers Berlioz in general terms, as a composer out of the main stream. Robert Lawrence was producing some appreciative writing in the forties in the New York Herald Tribune and the Saturday Review of Literature. Deems Taylor aired views on the Symphonie Fantastique in The Well Tempered Listener (New York, Simon and Schuster, 1940). A Short History of Opera (New York, Columbia University Press, vol.1,1947) by Donald J. Grout shows a fair appreciation of Les Troyens, but seems off the mark when treating Benvenuto Cellini; his History of Western Music (Dent, 1962) gives a straight account of Berlioz and Romanticism. P. H. Lang’s Music in Western Civilization (New York, Norton, 1941) shows little understanding of Berlioz, and Lang’s ‘Berlioz’ (Saturday Review of Literature, December 1946) subscribes to the often heard views of those who find no unity in Berlioz and end up by calling him, in puzzlement, a genius in part only. For a long time no spectacular critical work appeared in America. With the publication of Berlioz and the Romantic Century (2 vol., Boston, Little, Brown, 1950; London, Gollancz, 1951), Jacques Barzun showed an unsuspected sense of situation and timing. He produced the revaluation of Berlioz that nobody was expecting; and as soon as it was understood, it was regarded as inevitable. There had been no earlier standard biographical study in either English or French. (As for the French work by Boschot, dating from 1906, although shored up with massive documentary research, it failed to inspire confidence in Berlioz as a figure of great integrity or stature.) Barzun’s achievement was to establish Berlioz as a man of strength and stability, not the grotesquely weak and over-emotional person as he had so often been represented. The author’s broad, humanistic views, coupled with a deep knowledge of the period, allowed him insights into Berlioz’s mind such as no previous critic had ever quite achieved. He also edited Berlioz’s New Letters 1830-68 (New York, Columbia University Press, 1954) and translated Berlioz’s Evenings with the Orchestra (New York, Knopf, 1956), as well as contributing the essay on Berlioz to the 1963 printing of the Encyclopaedia Britannica. It is difficult to estimate what the future of Berlioz criticism would have been without Barzun. Barzun’s influence has been great. Debunking is no longer either fashionable or profitable. Most American critics by now have Berlioz well under their belts. Bernard H. Haggin has made the point that Berlioz still needs to be heard. In ‘Berlioz’ (Kenyon Review, no. 4, 1955) he analyses some of the lesser known works. Winthrop Sargeant in the New Yorker, and Irving Kolodin in the Saturday Review have covered some performances. Record reviews are frequent. The development of the long-playing record has done much to spread knowledge of Berlioz’s music both in America and in England. The American Berlioz Society had an active but brief life from 1953 to 1956, but there were encouraging signs in 1969 that it might be reconstituted. The English Berlioz Society, begun under the secretaryship of Ronald Bernheim in 1952, and with Barzun as its president, issues a valuable bulletin. Two new figures have come to prominence in the 1960s, both from the Berlioz Society. Hugh Macdonald has emerged as the foremost Berlioz authority in Europe. He has swiftly and convincingly made a reputation in both academic and musical circles. His ‘Berlioz’s self-borrowings’ (Proceedings of the Royal Musical Association, 92nd series, 1965/6) was also broadcast. He has contributed several articles to the Musical Times, of which may be mentioned ‘The original Benvenuto Cellini’ (December 1966) and further recent studies in this Centenary Year, 1969. As general editor of the New Berlioz Edition he has brought out the widely praised full score, with notes and comments, of the Symphonie Funèbre et Triomphale, which augurs well for the rest of the Edition, and for the future of Berlioz scholarship. As music critic on the Financial Times, the Spectator, now on the New Statesman, David Cairns has been steadily and successfully urging his sane and sensible estimate of Berlioz on the public, the success of the composer in performance in recent years being in no small measure due to his efforts. He has written on ‘Berlioz and Colin Davis’ (Musical Times, July 1961), and has covered many concerts since, recently finding many new dimensions in Les Troyens. The article in Robert Simpson’s The Symphony (Penguin, vol. 1, 1966) is by Cairns. His early promise has been confirmed in this Centenary Year by a masterly translation and annotated edition of The Memoirs of Hector Berlioz (Gollancz, 1969), which has been widely praised for its reasonable and sensitive approach. Full recognition has eluded Berlioz all too long, both during his life and for many years afterwards. Let us now kick irony gently upstairs and say that he seems to have reached it one hundred years after his death. 1. See Editorial [ADAM International Review, 1969, nos. 331-333]. 2. Dickinson, Alan E F, The Music of Berlioz (London, Faber and Faber, 1972)]. * We are most grateful to Mr Michael Wright for granting us permission to reproduce this article. We have transcribed the text of the article from the ADAM International Review, 1969, nos. 331-333, a copy of which is in our collection. We have not been able to contact the editor of the ADAM International Review, which has ceased publication. The Hector Berlioz Website was created by Monir Tayeb and Michel Austin on 18 July 1997; this page created on 11 December 2011.